Centreville is an unincorporated historic village known as the location of Du Pont family estates. Photo: Carpenter-Lippincott House, ca. 1840, 5620 Kennett Pike, Centreville, DE. Listed on the National Register of Historic Places in 1983. Photographed by User:Smallbones (own work), 2011, [cc-by-1.0 (creativecommons.org/publicdomain/zero/1.0/deed.en)], via Wikimedia Commons, accessed October, 2014. Centreville owes its existence, and indeed its very physical character, to a road the original Wilmington and Kennett Toll Road, today known as the Kennett Pike. One hundred and sixty years ago Centreville was an active commercial center that developed as a result of its convenient location along the route from southeastern Pennsylvania to the mills and ships at Wilmington, Delaware. Consequently, inns, taverns, blacksmith shops and small businesses were opened in Centreville to cater to the travellers. In 1868, Centreville was a small, rural, cross-roads community with businesses and residences situated out along the north and south sides of Kennett Turnpike at the intersection of the "Newport Road." Today, Centreville retains its rural character and in outward appearance reflects the growth of this cross-roads community during the nineteenth century. Suburban development during this century has begun to encroach upon the edges of the village. However, because of the low-density or large estate nature of this residential development, the impress of the surrounding countryside is still largely rural. In the eighteenth and early nineteenth centuries, when Unionville, Pennsylvania, was the center of the cattle business in southeastern Pennsylvania, the way to market from Delaware was through Centreville on what was the Doe Run Road and today the Kennett Pike. Farmers would bring their herds to town to be "shaped-up" and driven to market. On January 21, 1811, the Delaware State Legislature granted a charter to the Wilmington and Kennett Turnpike Company to maintain a hard-surfaced, twenty-foot arched road, on a 100-foot right-of-way from the Wilmington Borough line to the Pennsylvania State line. This turnpike was considered the best route to tidewater for the rich farming section of Pennsylvania bordering Delaware on the north. Early turnpike tolls were one and one-half cents for two oxen or one horse, cart or carriage; six cents for 20 sheep, twelve cents for a score of cattle. Church goings or funerals were toll free. Centreville developed and grew along this route to serve the traffic of carters and drivers, with taverns, inns and blacksmith shops and it was not unusual for Centreville to have as many as 50 teams stopping on one night. Scharf mentions in his History of Delaware, that in 1821 Centreville had a "good store kept by James Delaplaine who prospered there as a merchant." By mid-century the village, stimulated by agricultural prosperity, had experienced considerable growth. The town population in 1850 included a number of farmers, two innkeepers, two shoemakers, a physician, a carpenter, a stone mason, a drover, a teamster, as well as a number of common laborers. 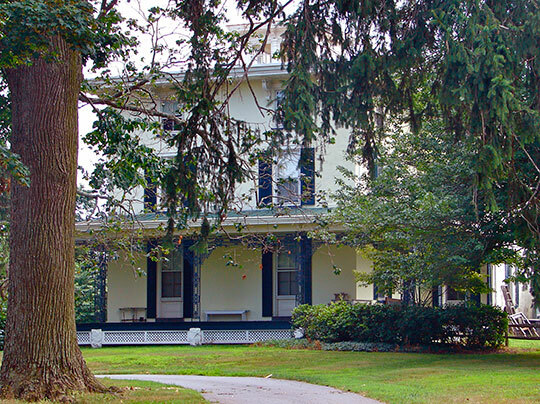 Centreville was the home of Dr. Joseph H. Chandler, who served a large clientele of Pennsylvania and Delaware residents. An apothecary shop, blacksmith shop and a post office were available. The burgeoning agricultural economy continued to bring change to Centreville. By 1888, continues Scharf, "Centreville had a number of fine residences, a good public hall, several stores and an inn." Centreville flourished until the latter 1800's when the railroad arrived offering quicker service and an easier ride. Conestoga wagons were no longer needed to carry the goods to port. The number of businesses began to dwindle, the inns went out of business and were demolished, and Centreville became a rural hamlet. Gretchen Fitting and Richard Jett, New Castle County Department of Planning, Centreville multiple Resource Area, New Castle County, Delaware, nomination document, 1983, National Park Service, National Register of Historic Places, Washington, D.C.